This humble dish has had its fair share of being looked down upon and viewed as trash fish, but nothing could be further from the truth. They are wonderful to eat and can even be the center piece of a gourmet meal when it is prepared and served like any other great fish. Instead of the traditional deep-fried style with corn meal, Chef Gorji has given it a“new Mediterranean”spin. He brushes it with olive oil, salt and pepper and coat it with bread crumbs and then pan-sear it in olive oil. 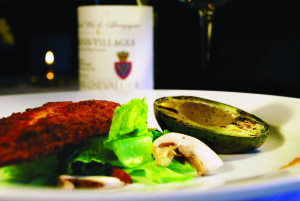 Served hot on a cold artichoke salad with a grilled chilled avocado, it has hot and cold temperatures and textures. “It is always welcome on my menu. Guests are surprised when I pair it with French wine. Many say they didn’t know they even liked catfish until they tried it prepared this way”, says Gorji. 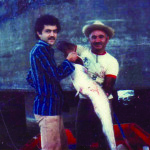 A catfish Gorji caught in the Caspian Sea delta many, many, many years ago! Cook editor Anne Dolce of the national food blog, The Daily Meal, agrees that the quirky, unusual fish doesn’t have to be all about grease and French Fries. And according to the The Catfish Institute: “U.S. 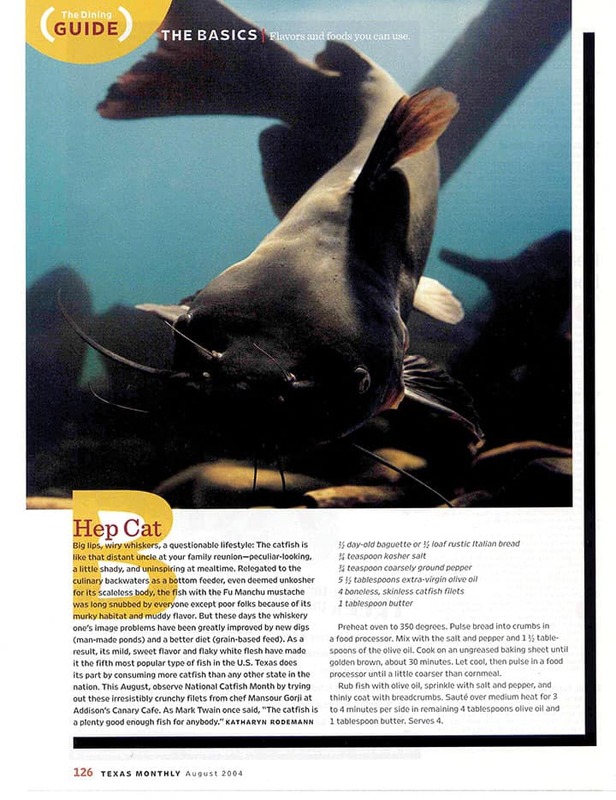 Farm-Raised Catfish is a lean fish and an excellent source of protein. It is low in saturated (bad) fat and is a moderate source of polyunsaturated (good) fat and omega-3 fatty acids.” It is an American farm-raised offering that is sustainable. It is surprisingly simple and easy to prepare at home. See recipe here. 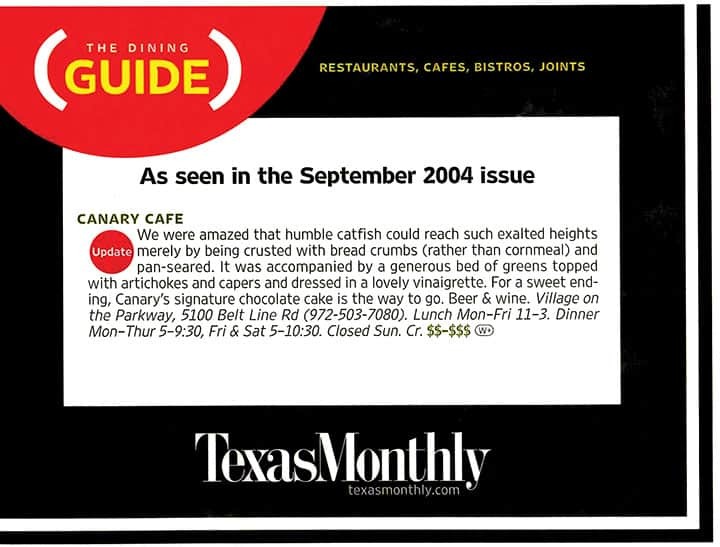 1 Reply to "National Catfish Month: Converts Trade Deep-Fried Crunch For Pan-Seared Sizzle"
I guess my inner native Texan had this fish double-dipped in corn flour batter then deep-fried with hush puppies and that’s all I had in my head as far as preparation. I saw that you have the recipe for your more sophisticated catfish in Zing! and can’t wait to try it out in the next week or so. There are many “catfish ranches” in the North Texas area supplying the local fish markets, but I’m hoping a great friend will be giving me some from my beloved Lake Travis shortly. Will let you know how it goes, and thanks for keeping catfish on your menu.